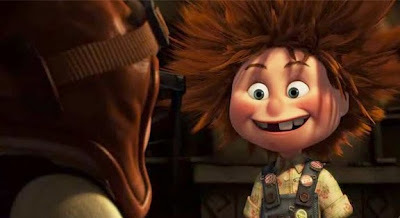 First, the most obvious argument for Ellie: she exists as a proven character created by artists still working together at the most successful animation studio in the frickin’ universe, Pixar. She would be hard to screw up. 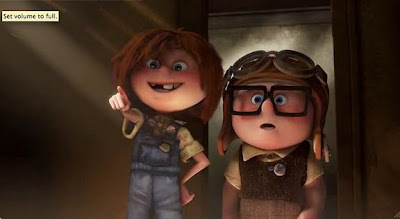 Second: Ellie radiates virtues and passions difficult for any of us to evoke whatever our gender, age, or calling; she can show humanity worldwide how to make everyday life fun, meaningful, and authentic — while being entertaining and adorable. This is especially important when independent, expressive, ambitious young girls, women, and the men who adore them (and who are made stronger by them) are under attack so explicitly on cultural — not economic — fronts, worldwide. As bizarre as it may be, we share a world with fathers who pay physicians to cut the clitori off their daughters — at a rate of over 2 million girls every year; amazingly, we are also sharing our God-forsaken planet with parents who kill — solely because their children are girls — nearly 100 million Ellies before they are born every year. Neither of these direct assaults against female humans are due to economic reasons. How is this possible? These attacks are motivated by ideas which can be changed for free — at no cost — even while temporarily psychotic minds undergoing change pay to be altered and entertained. Then there are the glass ceilings of our open-air global madhouse: the incompetent uneducated men throughout the world who are somehow dependent upon women to calculate, translate and basically transact everyday business for the companies these men supposedly manage. Dowries, arranged marriages, veils, chadors, mandatory headscarfs, required overcoats, full body swimsuits, hajibs, niqabs and God knows what else to hide and sequester feminine beauty — round off this cultural attack on all humanity. We do not need to make societies wealthier to change these ideas. We can change expectations by teaching lifestyles embodied in entertaining, fun, endearing characters everyone wants to watch everywhere. 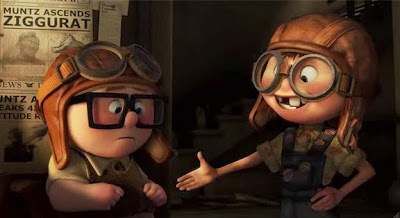 Pixar could run with this opportunity as quickly and as far as Ellie’s spirit will take them — with little risk, with the virtual assurance of profitable accolades, and, with the satisfaction of having woven deeply into our global social fabric the most important female spirit thus far recognized. 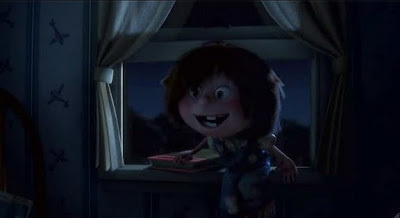 She does not need to be a freckled red-headed cartoon, either; Ellie’s spirit could be embodied in an animated caterpillar, carrot, or gigantic monster — who can imagine what: with a vibrant sense of self-respect, a fun uninhibited exuberant drive for self-expression, and an uncompromising straightforward sense of oneself as a unique female person. Congratulations to Peter Docter, Bob Peterson, Ronnie del Carmen and the entire Pixar story crew for boarding such a precious positive role model. O Ellie, Ellie! Wherefore art thou!!!!!!!!!! This entry was posted in Character Design, Ellie, Philosophy, Women on 2010/01/13 by FriendlyHelper.